Want to celebrate a company anniversary or special event. This bank note has a very high perceived value and could be the perfect high end gift for staff of key clients. The photos and specs below are showcasing the Euro 500 note. 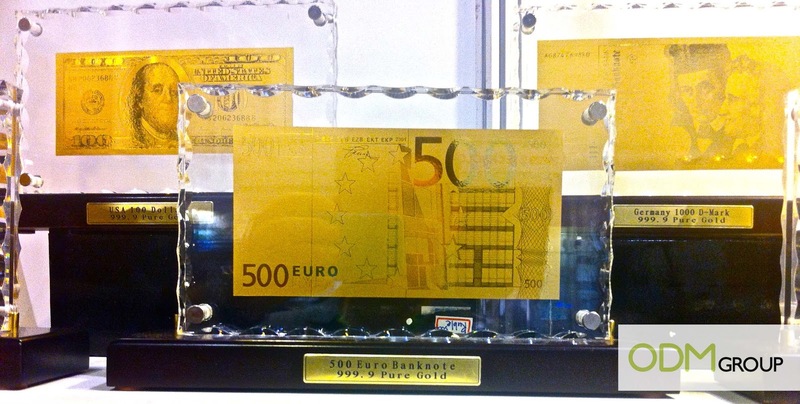 ．All gold banknotes are mounted with the high-end tempered glass frame. ．The surface of each gold bank note and historical world map is made of 24K gold leaf. ．Each product goes with a hand-made and firm gift box. Note inside is 100% secure. ．The backside of the frame is totally neat without the presence of staples. ．Either red or black tempered glass frame is available. ．OEM and ODM custom designs are welcome. Another option is to use a simple wooden frame. ．A large variety of banknotes is available. ．Each Set is mounted in fine solid-wood frame. ．The color of each banknote remains permanently. comes with an individual certificate of authenticity. In celebration of their 10th anniversary in Russia, Auchan is running a gift with purchase promotion in which they give away free magnetic calendars. Just subscribe to the news updates on the Auchan site and you will get your calendar within days. This is a great marketing strategy to promote the brand. First of all, the calendar is branded with the company’s logo, corporate colors, and product pictures. Since it is a durable promotional item, it makes an efficient advertising tool for Auchan. Secondly, Auchan will be able to collect a lot of valuable information about its clients, including some personal data. This could possibly be used in the future for market research and additional advertising. Electric Lighting Company Martin Professional's 25th Birthday! For their 14th anniversary, Starbucks, ran a GWP promotion. In this promotion they were giving out Starbucks Planners in return for Starbucks stickers. Starbucks stickers come with every drink purchased (bottled drinks not included). Once you have collected 14 of the these stickers (cleverly devised by Starbucks for their 14th anniversary), you can trade them in for the stylish Starbucks Planner. The planner comes in a small variety of colours; red, blue and beige. A planner is a great anniversary gift. It will not only count down the days until the next anniversary, but branding this promotional gift allows for free advertisement. Through this advertisement your company logo will then become more recognised and trusted. This will therefore boost sales within the business, so is a perfect marketing gift. In celebration of their 30th anniversary, Summit Shoes held a gift with purchase promotion in which they gave away a free Limited Organiser Bag. This was an exclusive promotion for members only. If you spent RM120 or more in one receipt, you would have received a Limited Organiser Bag completely free! An organiser bag (or any type of bag for that matter) is a fantastic promotional gift. Bags can be a huge variety of shapes and sizes and are very easily customisable. Your company logo or branding can be printed on this sort of promotional gift with ease, and with an everyday item such as a bag, your logo will be on-show throughout the day. Therefore increasing brand recognition for the company! Deborah Lippmann is celebrity manicurist and creator of her own line of nail varnishes. She just had her birthday earlier this year. In celebration, she promoted her Deborah Lippmann's Happy Birthday Nail Lacquer. The Happy Birthday Nail Lacquer came free with any purchase over $50 on her Lippmann Collection website. This included free next day delivery! There's nothing better than a limited edition GWP to go with a large haul of Deborah Lippmann branded goods. A perfect gift for yourself or, if you're a guy, that special lady friend. Check out some more blogs on our Promo Gifts website. By using these high end promotional products in your corporate anniversary campaign, they associate these kind of products with your company. Similar to if you get a cheap cardboard bookmarker, you associate the company with cheap products. This metal engraved bookmark is a promotional product that will stay with consumers for a long time, consistently reminding them of your corporate achievement's. This anniversary pin is an excellent way of promoting your company birthday through proud staff/consumers can wear them for everyone to see!! The corporate anniversary focuses on the 'Share a Martin Moment', whereby consumers can post on Facebook or on their website. This includes concerts and memorable events, a great way for consumers to promote themselves as well as the company! These kind of promotional campaigns can be relatively inexpensive, but very effective when working in the entertainment industry; utilising consumers emotions- taking them back to a music event that was important in their lives. There are many ways to celebrate a corporate holiday, see these related posts, or contact one of our dedicated staff at The ODM Group to discuss your future promotions! Why celebrate your corporate anniversary? These kind of promotional products are great for supporters, alumni, volunteers and members! The calendar boasts never seen before photos of the guides in action- a perfect way to tempt consumers and promote the organisation. Promotional calendars can be perfect for increasing brand recognition, speak with The ODM Group today about designing your own custom calendar! It is always important to keep pressuring your factories when producing your anniversary promotional products, otherwise production time could slip away from you. As you can see from this video, a manager was not present, this can lead to employees lazing around, which ultimately affects the quality of the products. This can mean that production times can be extended unnecessarily. This is especially important when producing for Anniversary Promos, because this is date specific. This can be seen as a draw back from outsourcing goods, however this inefficiency can be controlled by having your own operatives in factories overseeing these processes. The ODM Group is a perfect example of these western companies; utilising in-house design team to ensure your products are exactly the way you want them. In addition utilising western Project Managers and Quality Control Operatives to warrant the products are up to quality standards needed in developing and developed markets.